Coveting a few new drool worthy spring fashion pieces, but your closet is overflowing and bursting at the seams? Then it may be time to allocate a bit of RealReal time to turn those unwanted Gucci, Chanel, Louis Vuitton and Prada items you have collecting dust; and is either still in style, new, gently used or vintage, to cold hard CASH. 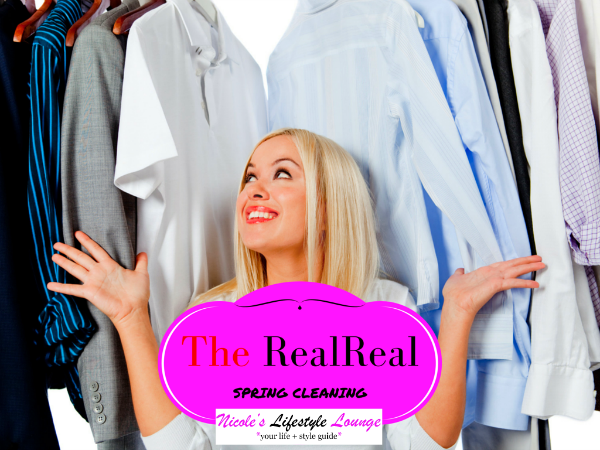 Spring cleaning and organizing your wardrobe is not promised to be a fun project, but who says it can’t be rewarding once you have made your keep, sell and donate piles? The RealReal is the leader in pre-owned luxury consignment. They accept pre-owned and authenticated luxury items including men’s and women’s luxury fashion, fine jewelry & watches and fine art. So why hold on to expensive items that you don’t wear, when you can sell them and get some money back. I don’t know about you, but that sounds like a profitable way to organize and purge your closet. The RealReal sells pieces from the biggest designers to fine jewelry and watches, and blue-chip art. TRR makes the luxury consignment process easy with free in-home white glove pick-up in 16 U.S. cities, or free shipping via FedEx. Available at no charge, is also the free pack and ship service through FedEx Office Retail Centers. First time consignors receive 60 percent of the sale, and when they reach $7,500 in annual sales elevate to 70 percent. Items sell quickly — most within 3 days, and consignors can track their sales from a personal online dashboard. They only accept items less than 10 years old. There are additional restrictions for certain designers. They only accept a select list of designers for leather and pants. Online consignment is the most rewarding and convenient way to edit your closet for spring. So why not do it the RealReal way? This post may contain affiliate links, which may yield a commission.